All aboard the swim train! Catch the narrow gauge train to the end of Llyn Padarn to start your swim for a truly unique experience! With the spectacular backdrop of the Snowdon mountain range, the historic Dolbadarn Castle and Welsh slate quarries you can choose to swim the length of the lake, either once, twice or three times! We have a mid length option too! The BIG Welsh Swim will take place in Llyn Padarn, Padarn Country Park, Llanberis, Snowdonia National Park, North Wales. The swim route will involve lengths of the lake (each length is 3km) with a choice of 4 different distances to choose from. Wetsuit and non-wetsuit places are available! The lake is surrounded by some of Snowdonia’s most stunning scenery including beautiful woodland, a historic castle, the old slate quarries that tower above the valley and the small narrow gauge railway that we’ll use to transport you to the end of the lake! location: Gilfach Ddu station, Llyn Padarn Railway, Llanberis, North Wales. LL55 4TY. Aid stations: 3 stations over each length of the lake: both ends and half way point. Cut off time: 5 hours from start time for each distance. The race organisers and appointed staff can retire a participant at any time if they judge them not capable of finishing due to fatigue or poor physical condition. Online entry opens: 15th July 2018. You must be over 18 years of age on the day of the race to enter the event. 16+ participants will need parental consent to take part in full length swims. Under 16’s can complete the Mid way swim if accompanied in the water by an adult who will take complete responsibility for them. There will be a maximum number of entries available for each distance. When that number is reached entries for that distance will close and a wating list will open. Additional equipment that may NOT be used: Snorkles, flippers, hand paddles, webbed gloves, headphones, pull buoy, buoyancy shorts or other floation aids, any power assisted aids. You will be issued with your event hat and timing chip. Please arrive as early as possible and take note of the parking arrangements as there may be a short walk! The compulsory briefing will be held at 8.40am on Saturday 13th July 2019 at Lake side, Gilfach Ddu. 3 way and half way swimmers will board train 1 which will leave promptly at 9.00am so need to be ready to leave syraight after the briefing. 1 way swimmers will board train 2 which will leave promptly at 10.00am. If you miss the train you will need to make your own way to the other end of the lake. Participants doing a two way swim do not need to catch the train. There will be a place for 6km swimmers to leave shoes/ 1 SMALL bag close to the swim start. 1.5km, 3km & 9km swimmers may take shoes/1 SMALL bag with them on the train and this will be transported back to the finish line to be picked up at the end of your swim. Please only leave essential items and do not place fragile or valuable items in the bag drop as we cannot take repsonsibility for them. A provisional version of the event handbook which contains all the information you will need can be downloaded here. An updated final version will be available a few weeks before the event. Please read all the information throughly to get the best out of the day! Going on average water temperatures for the end of July over the last few years, we expect the water temperature in Llyn Padarn to be between 16°C and 18°C for the Big Welsh swim event. The temperature in the lake can vary quite a lot depending on the amount of rainfall and sunshine we have but we will keep you updated on the water temperature in the run up to the event. The Big Welsh Swim 2019 commemorative tshirts are available for pre-order (to pick up on the day of the event) when you sign up to enter. These are £15 each and are etchically produced from organic cotton using only renweable energy! They are hand printed locally using environmentally friendly inks. 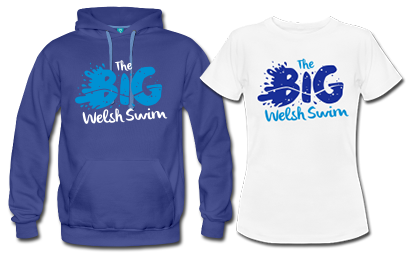 Love SwimRun and The Big Welsh Swim everyday vinyl printed logo t-shirts and hoodies are available for mail order in the Love SwimRun shop. Males sizes seem accurate. Female sizes come up small, so if you like a fitted look order your normal size or if you like a slightly looser fit go for a size up (eg for size 10: Small = fitted, Medium = looser fit). Wild Trail will be helping to fuel you on our events this year as our official nutrition partner! Their all natural fruit and nut bars are made with just 5 simple ingredients you’ll know and love, see them at www.wildtrail.co.uk. They are gluten free, dairy free, have no added sugar, are high in fibre and suitable for vegetarians and vegans! Best of all, Wild Trail bars are inspired by Snowdonia and are made locally in Wales. We are super exited to have Zone3 on board as our Big Welsh Swim event sponsors. They will be suppling the winners of each category with a prize. Zone3 are also offering all Love SwimRun participants a 25% discount on their range of swimming gear and wetsuits! You will receive a special discount code once you have registered. Love SwimRun are supporting Level Water during this event. We all know how wonderful swimming is! Level Water provides free one-to-one swimming lessons for children with disabilities. Without these lessons, most of these children will never learn to swim. They provide lessons until children can swim 15m frontcrawl and backstroke. From this point, these children are safe and independent in the water. They can join group swimming lessons and even their local competitive swimming club! The swimming lessons also help children with physical or sensory disabilities to develop confidence, self-esteem and resilience. If we can give a child physical, social and emotional confidence through sport, we can change their trajectory in life. Please help support Level Water by making a voluntary donation when you enter The Big Welsh Swim. Thank you! Hot drinks, snacks and delicious hot food will be available to buy when you finish your race. All competitors will receive a Big Welsh Swim Medal and a Wild Trail bar at the finish line. Prizes from Zone3 and Love SwimRun will be awarded to the first 3 male and female swimmers in each wetsuit distance category, and first three swimmers in the non-wetsuit category. Prizes must be collected on the day and no cash alternative to the prizes will be offered. There is plenty of public parking available near the event base (£4 for the day) Disabled parking is available there too. Please do not park on the road or cause any obstructions to access or gate ways. There are public toilets in the middle of the main car park, including disabled toilet. There changing areas but there are no shower facilities. By car: Llanberis typically is 5 hours from London by car, 2 hours from Manchester. To access Llanberis turn off at Junction 20 of the M6 onto the M56, follow signs for NORTH WALES to reach the A55. Use post code LL55 4TY in your Sat Nav and follow signs for the Slate Museum. Public transport: The closest train station to Llanberis is in Bangor. Buses run from Bangor to Llanberis. See our list of local accommodation providers here. Spectators are welcome to come and support you at The BIG Welsh Swim! There are plenty of good spots from which to support your friends. There is disabled access to the registration/finish area though this is on a rough track, not tarmac. Dogs are welcome on leads. Why not catch the train yourself? The first public train will run at 11.45. There will not be places available on the participants swim train for friends/family members I am afraid. If you take any photos or videos we would love to see them! If you are interested in marshalling on the day, please get in touch! Please read the race rules and terms and conditions of entry throughly before signing up. You can read them in full here. Please be aware that we offer a no refunds policy and limited entry deferral options. You are permitted to transfer your entry into another name. Please see out FAQ page for more information. We recommend you take out individual sports event insurance to cover any losses due to unexpected circumstances that prevent you from taking part.